Looking for a functional, family-friendly home that without having sacrifice on style, Jenna and Paul turned to Lime Building Group to see through the construction of their elegant Hamptons home located on the South Coast of New South Wales. 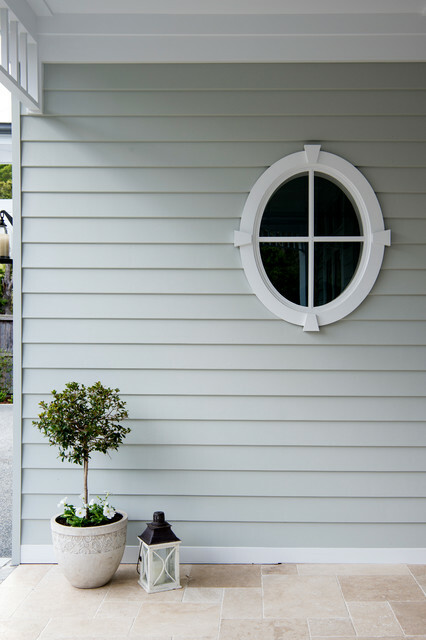 The Scyon Linea Weatherboards utilised here are not only visually impressive but durable and fire resistant. Thus leaving the owners with a sense of security and assurance other materials lack. Love the colour combination, what colour paint is this? Georgia Madden added this to How Do I... Create a Hamptons-Style Exterior? Scyon’s Linea weatherboard is my favourite. It’s durable, low-maintenance and provides clean, horizontal shadow lines. You can also apply it straight over brick or render, and paint it if you choose. I’d suggest using the 150-millimetre profile for smaller homes and the 180-millimetre profile on larger abodes.